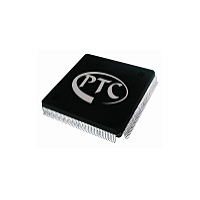 General Purpose LCD Driver IC (PT16580) - Princeton Technology Corp.
PT16580 is an LCD Driver IC which can drive up to 200 segments. It can be used for frequency display in microprocessor-controlled radio receiver and in other display applications. PT16580 supports both 1/3 duty, and 1/4 duty drive. Pin assignment and application circuit are optimized for easy PCB layout and cost saving advantages.